Turkel Design is a leading manufacturer of prefab homes. The firm has partnered with Dwell to develop the Axiom series, a modern prefab model that's designed to be functional, attractive, and energy-efficient. Read excerpts from Dwell's interview with principal Joel Turkel below, and click through the slideshow for a glimpse at the Axiom homes. 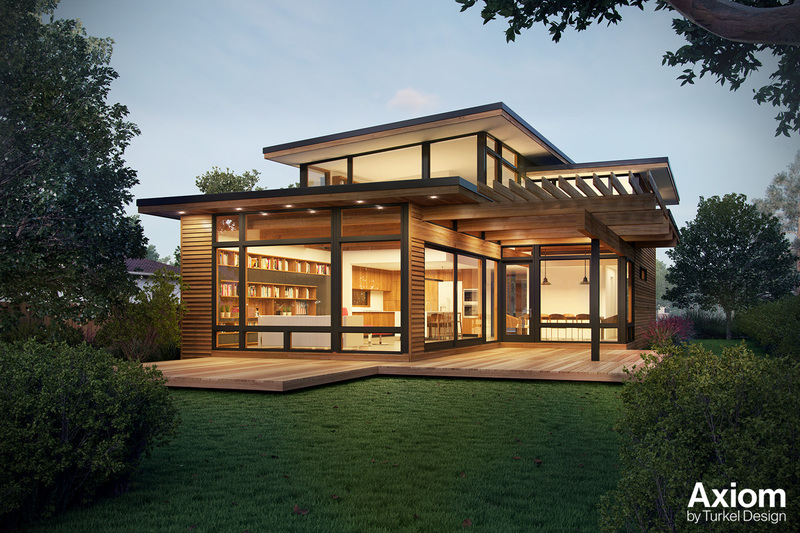 Interested in learning more about the Axiom/Dwell Prefab series by Turkel Design? Visit our webinar page for upcoming free online webinar dates. The Axiom 2340 model features a deck space off the great room and light-filled, high-ceilinged living spaces. A look at the interior of the Axiom 2340. The Axiom 2790, ideal for sites oriented toward one direction, features a covered terrace. One of the main features of the Axiom 2450 model is a porch that's enclosed by a 12-foot rectractable glass wall. How would you describe the state of prefab overall? It's inundated with architects who are trying to architecturalize the problem; they want the issue of prefab to be an architecture problem. It's like the saying When you have a hammer in your hand, everything looks like a nail. It's much more about the delivery mechanism though: When you walk out the door as a consumer to buy a house, what are all the things required for you to turn the key in the door and walk into the house? The delivery mechanism included what it is, what it's made of, where you get it, who builds it. Architecture is one important piece of the equation but not the whole piece. It takes a series of devoted parties who all bring a subset of important expertise to the table. The state of prefab is really disorganized. To be successful people need to leverage the capacity of other people who do things really well and work in conjunction with them. Our readers want prefab architecture to equal inexpensive architecture. How can that happen? It's an understandable desire but also makes no sense when you look at market size. Costs come down when volumes go up. A Hyundai costs what it does because they make 50,000 of them. Prefabs are such a minute part of the housing market. There's no way the price is going to go down because 30 prefab homes were sold in one year.